Nodle.io is the first low power network for the IoT, announcing today the release of our rap single for the holiday and the connection of one million daily nodes. We provide internet connectivity to IoT devices by crowdsourcing a network of smartphones and other IoT devices. We dramatically reduce the cost of device-to-device communication and are dedicated to making the internet accessible to everyone, everywhere. The Nodle network, called The Citizen Network, is made up hundreds of thousands of “crowd sourced” devices that work collectively to provide internet access. 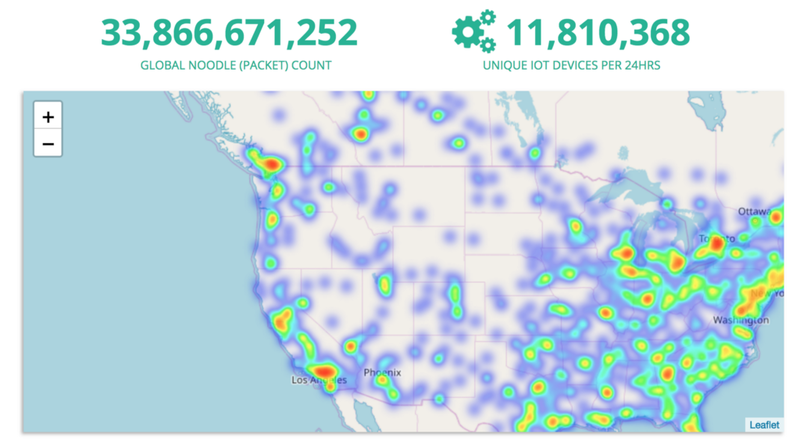 Nodle’s network is the largest dedicate IoT network ever deployed. The Nodle Dashboard tracks daily unique IoT devices connected to our global network. Traditionally, it is difficult to connect remote devices to the internet. At Nodle, we utilize the power of long range Bluetooth and software to provide a “plug and play” solution that is simple and inexpensive. No additional hardware is needed to run our global network. Ultimately, we believe “connectivity should be free, simple, and global,” says Micha, Nodle’s CEO, previous founder of FireChat. Because Nodle provides an opportunity for IoT deployment in remote locations, no one needs to be disconnected. When distributed, the Nodle system will enable an entirely new ecosystems for the IoT. Currently, we work with Fortune 500 companies, cities, and consumer tracking brands. This includes food and beverage brands, who partner with Nodle to track hundreds of displays across the country; The City of Paris (Le Grand Paris) who leverages Nodle technology to track outdoor park furniture, such as benches and kiosks, doubling as beacons to help the city conduct surveys on the quality of the parks; and hardware companies in need of supply chain tracking. The Nodle network is live and operating today, extending coverage beyond the reach of cellular networks. We are open to contributing with app developers who earn NODL coins in exchange for connectivity. To join the movement, or to learn more, please connect with us here. Nodle Releases Rap Video For the Holiday and Celebrates 1 Million Daily Nodes was originally published in Hacker Noon on Medium, where people are continuing the conversation by highlighting and responding to this story.